Then the 13 weeks average over a period of 13 weeks. See the row last row called "Avg. 13 wks." Besides these the "13 weeks Currency Classification" chart of each currency is also consulted and compared. These have been updated and can be found in the article: "Forex Currency Score Classification for Wk13". At the moment we can see that the AUD has a higher "Avg. 13 wks." score compared to the USD. The AUD has the same score as the CHF. 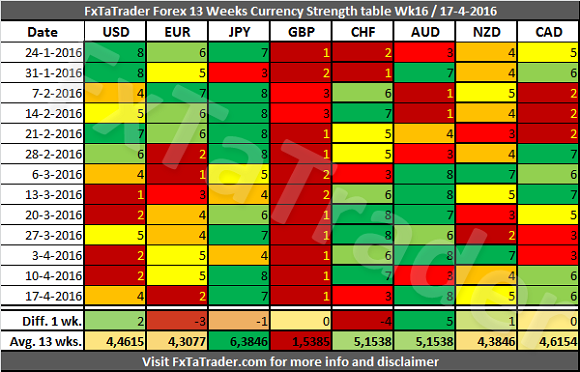 The USD and the CHF are both strong currencies in the "13 weeks Currency Classification". 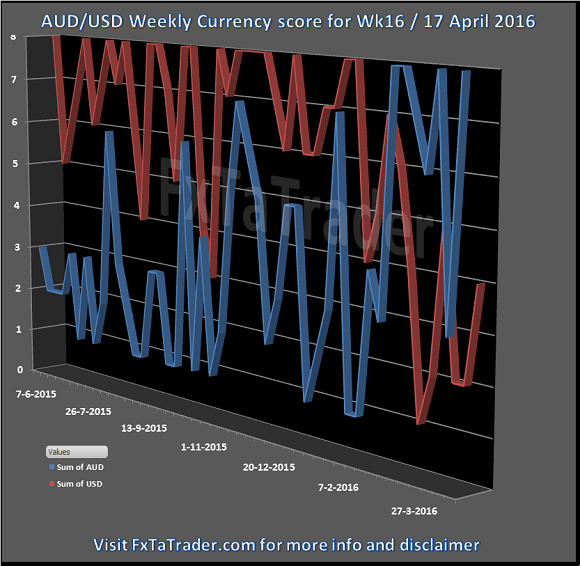 The AUD and the USD are pairs that could well change in the "13 weeks Currency Classification". At the moment it is too soon to make this change based on only the higher "Avg. 13 wks." The AUD had also 8 times a higher score in the last 13 weeks so it is possible that the pairs will change classifications soon. When looking at the Classification chart itself it is clear to see that the AUD is stronger lately. However, the Monthly and Weekly charts of this specific pair are showing a strong pullback but not yet a clear trend change. It is now at a resistance level which was a support in the period Q2, 2015. Based on the last "3 months currency classification" and the "Currency Comparison Table" the most interesting currencies for going long seem to be the JAUD and JPY. These are strong or average currencies from a longer term perspective when looking at the last "3 months currency classification". For going short the same analysis can be done and the EUR and the GBP seem to fit best. These are weak or average currencies from a longer term perspective. When analyzing the Weekly and Daily charts the best pairs for the coming week seem to be the AUD/CAD, AUD/NZD, CHF/JPY, EUR/AUD, EUR/GBP, EUR/JPY, GBP/AUD, GBP/CAD, GBP/CHF, GBP/JPY, GBP/NZD, GBP/USD, USD/JPY. 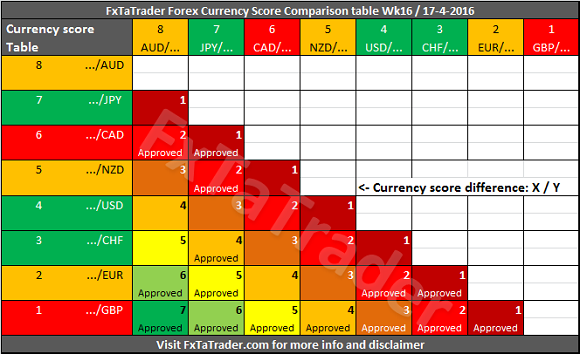 A crossed join between the Top 10 pairs in the "Ranking and Rating List", the "Currency Comparison Table" and the pairs with the best charts mentioned here above shows the following interesting pairs: AUD/CAD, CHF/JPY, EUR/AUD, EUR/GBP, EUR/JPY, GBP/AUD, GBP/CAD, GBP/JPY, GBP/NZD, GBP/USD. The AUD/NZD and the USD/JPY are not mentioned as "Approved" pairs in the "Currency Comparison Table". The USD/JPY and the GBP/CHF. These are not mentioned in the Top 10 of the Ranking and Rating list. From these pairs only the EUR/CAD does not seem to be interesting according to the mentioned crossed join here above.